As a journalist, Leigh Sales often encounters people experiencing the worst moments of their lives in the full glare of the media. But one particular string of bad news stories - and a terrifying brush with her own mortality - sent her looking for answers about how vulnerable each of us is to a life-changing event. What are our chances of actually experiencing one? What do we fear most and why? And when the worst does happen, what comes next? 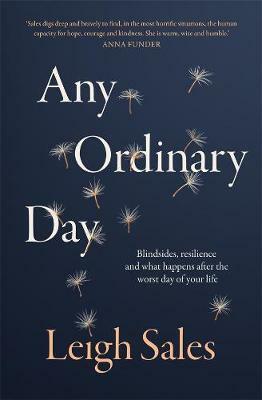 In this wise and layered book, Leigh talks intimately with people who’ve faced the unimaginable, from terrorism to natural disaster to simply being in the wrong place at the wrong time. Expecting broken lives, she instead finds strength, hope, even humour. Leigh brilliantly condenses the cutting-edge research on the way the human brain processes fear and grief, and poses the questions we too often ignore out of awkwardness. Along the way, she offers an unguarded account of her own challenges and what she’s learned about coping with life’s unexpected blows.